Does wisdom come with age? Does it come with experience? 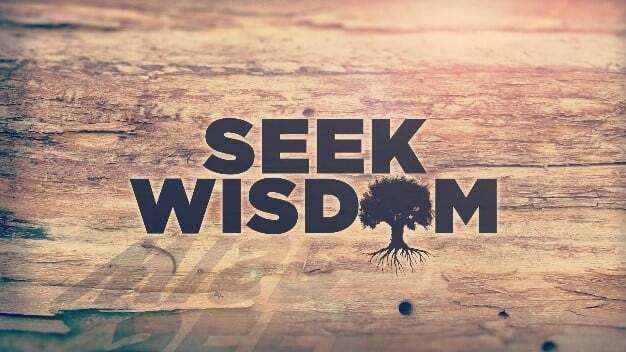 Whom do you consider “wise” and what makes them so? While I admit I would say “yes” to the first two questions and name people older than myself as those whom I would consider “wise,” Jesus, as he frequently does, throws our proverbial wrench into our human paradigms. In Luke 2:41-52 Jesus is only 12 years old and already growing in wisdom (v. 52). Joseph, Mary and Jesus take their annual spring trip from their home in Nazareth to the big city of Jerusalem for Passover. On that trip Jesus gets separated from his parents and maybe its not entirely unintentional. At age 12 Jesus stands on the cusp of adulthood, with boys becoming men at age 13. Part of becoming an adult is establishing our own identity and pushing against conventional boundaries. As a child he was the carpenter’s son, but as an adult he will become the Son of God. Regardless, Jesus has wandered off just as the festival has ended and everyone heads home. Mary and Joseph assume Jesus is with the group, but realizing he’s not, they drop everything and rush back to Jerusalem to search for Jesus diligently. When they finally find him in the temple, studying the Word of God with the teachers of the Law, Mary doesn’t have one of her better moments. She blames Jesus: “How could you do this to us! Look at the anxiety you caused your father and me.” And Jesus responds with disbelief: “Didn’t you know I must be here? Don’t you and dad understand me?” The answer is “no,” they don’t understand (“But they did not understand what he was saying” – v. 50). Parenting is hard work, even for Mary. When Gabriel told her she would give birth to the Son of God, he didn’t give her a manual on how to raise the son of God! When Jesus says “I must be in my father’s house,” he is not Jesus rejecting his parents or dismissing the role family members play in our lives. Rather, he is reminding us of the importance of this vertical relationship with God that must transcend all of our horizontal relationships with people. Why? Because we lose people. Mary and Joseph lost Jesus in this story. And sometime after this story Joseph will die and Jesus and Mary will lose him. By the time we meet Jesus again in chapter 3, he’s 30 years old and Joseph is never mentioned again. At some point, therefore, Joseph died. And so it is with us. In life we lose people and we lose track of people. We lose people when we move, or they move, or when we start a new school, or chapter in our life, or when they do, or when they pass away. Isn’t it true that when we look over our life, we find that we had friends – good friends – that only existed for a certain window of time, but then they were gone, replaced by new ones? And now, thanks to Facebook, we may be able to gather them all together. But of the 1000 friends you have on Facebook, how many do you really follow? 20? People come and go, but God – our parent in heaven – is always there; the one constant that remains through all that coming and going. Psalm 46 says, “God is our rock of stability… even though everything on earth can change.” Psalm 121says, “The Lord will keep your going out and your coming in from this time on and forevermore.” This is why Jesus “must” be in his Father’s house – to model for us how important it is that we connect with God. We love our parents. We adore our family and friends. But we worship God. For good reason. Wisdom, then, doesn’t come from age or even experience. It comes from strengthening our relationship with God amid all of the earthly relationships that impose their demands upon us. And Jesus shows us one way of doing this in Luke 2. First, by making time for worship in the house of God. Second, by spending time around the Word of God. And third, by asking questions of others who can help us learn the Word of God. This week, think of an issue you’re facing for which you would like wisdom. 1) What have you experienced in the house of God that can help you respond wisely? 2) What have you heard from the Word of God that can help? 3) With whom can you talk about your issue that can help you act wisely? Asking and answering these questions are ways of gaining wisdom, strengthening our connection to God, and allowing God’s Word to guide how we live in this world.